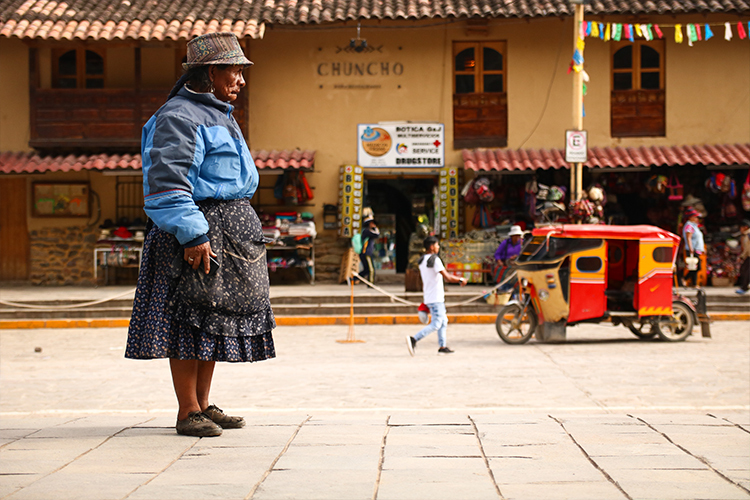 After more than thirty days in Peru, we had unusual experiences. In Peru, the Pacific waves offer the opportunity to enjoy (again) the pleasure of surfing. 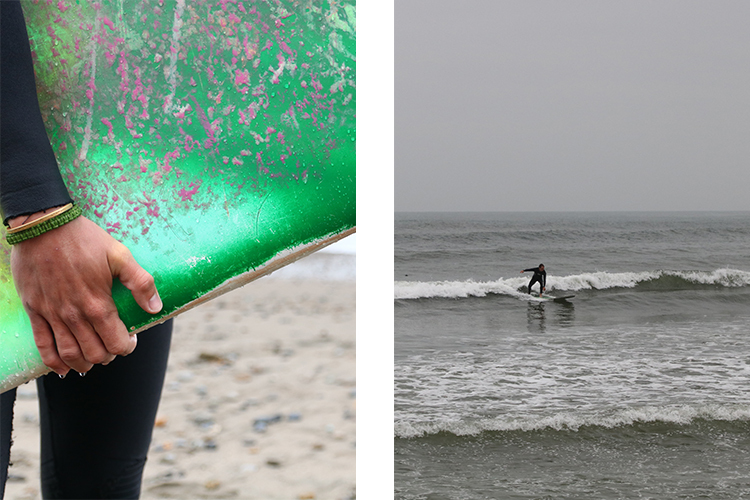 In the seaside Huanchaco city, the surfboard is king. With a foot on the barrier of the pier and hair in the wind, surfers are analysing the spot. Locals are mixed with Westerner tourists to surf on this regular wave breaking on the wooden pontoon. While we are walking on the promenade, a local surfer starts a conversation with us in French, happy to speak the language of Moliere. Many decades ago, he spent a few years in France. We speak about surfing in Europe and the Huanchaco spot that he knows perfectly. Following his advice, the alarm rings at 6am the following day. At this early time, I have the waves only for me. Incredible! The last session on the Plouharnel beach (Brittany area), was a few months ago. But the feelings are coming back quickly. After a few take-off to warm up, I am surfing on a good wave bringing me back to the sand. Exhausted, I am going back to the hostel for a shower. It’s 10am, it’s time to start the day! ravelling, it’s not only have good time. But the hardest moments are leaving us unforgettable memories. Robberry is feared a lot by travellers. With the stories from other travellers, we’re getting prepared, adopting sometimes absurd strategies. But this kind of thing will always happen when you least expect it. For us, it’s happened an evening during our stay in a family hostel in Ica. We arrived at the beginning of the evening and chose our beds in a shared room with an Italian. After unpacking, we went in the shared living room to share a beer with Luigi. A new traveller arrived with only one little bag. He chose the last bed available in the shared bedroom. After 5 minutes, he went out of the hostel saying he will get some food, but he never came back. Ten minutes later, we noticed the robbery of my mobile phone and one of the lens of Emilie’s camera. In this small hostel with only six travellers, we were less vigilant and didn’t locked our locker. A mistake which was the opportunity for a robber. Once the frustration gone, you need to put things into perspectives and be positive to enjoy the next adventures. Travelling on the roads of South of America means also meeting other globetrotters to share unique moments with them. Arriving at the Casa de Amelia, we didn’t expect an improvised evening with Margarita pizzas. 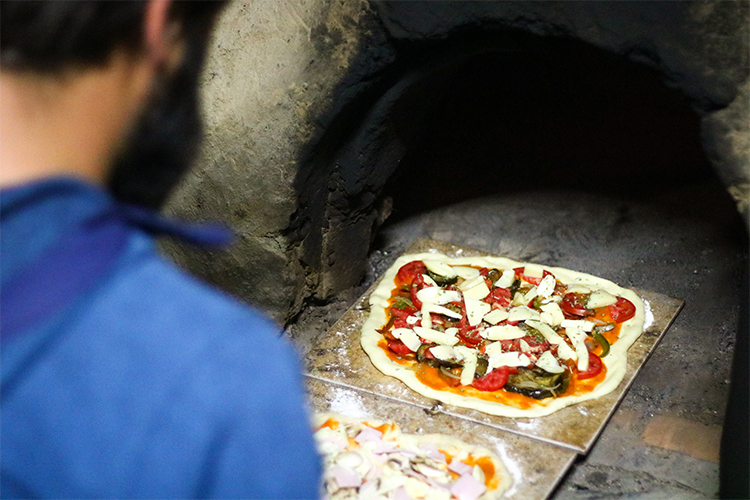 All the ingredients were there: a good traveler atmosphere, a large friendly table and a pizza oven. We just needed to find some food in the little shop next door to make the dough and to add veggies on our pizzas. The evening finished late (well, the travellers go usually to bed early and follow the sun’s pace…) with pizzas cooked one after another one. Itinerary advice are shared between people going towards North and the ones heading to South while drinking a few beers. There are flavours to please everyone in Peru! The Peruvian cooking is famous across the world but the following lines are focus on a product that you can find at each corner of the country which, however, never crossed the borders: the Inca Kola soda. It’s in all hands and in all fridges. The walls of the houses in the villages are fully painted with the brand colours: yellow and blue. The yellow is golden, this is also the colour of this drink. Is this golden colour is due to Incas loving this metal? Maybe! In any case, for us it was not a proof of quality but its popularity pushed us to try it. We enjoyed our first yellow and blue bottle with Cio and Beto’s children. This very sweet drink surprised us for this caramelised taste. 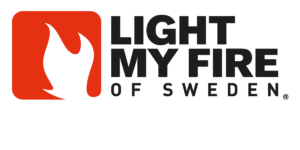 Once approved by the team, it was a new alternative to Coca Cola during the crossing of this country. The trip lead us to the summit of a Peruvian col in the rain. 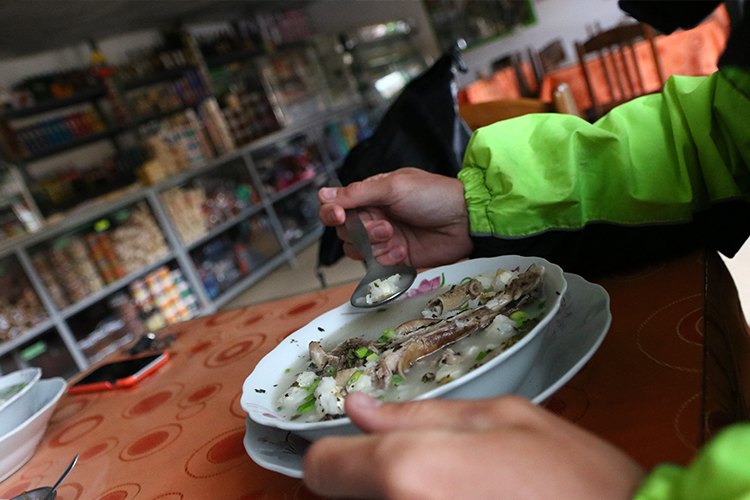 We stopped in a shop without a door, just the time to be protected from the rain and and to get warm with a lunch. Described by the lady of the house as a meat soup, Marie and I wanted to try the ‘“Caldo de Cabeza”, with the hope this dish will warm up our body. When the señora brought our dish, Julien had a smile. In the middle of the soup, a sheep jaw was floating. Being hungry and cold, we had enough motivation to eat the potatoes and other pieces of meat, and therefore did honour to the Chef. But it was a bit hard not looking the teeth of the sheep while eating! 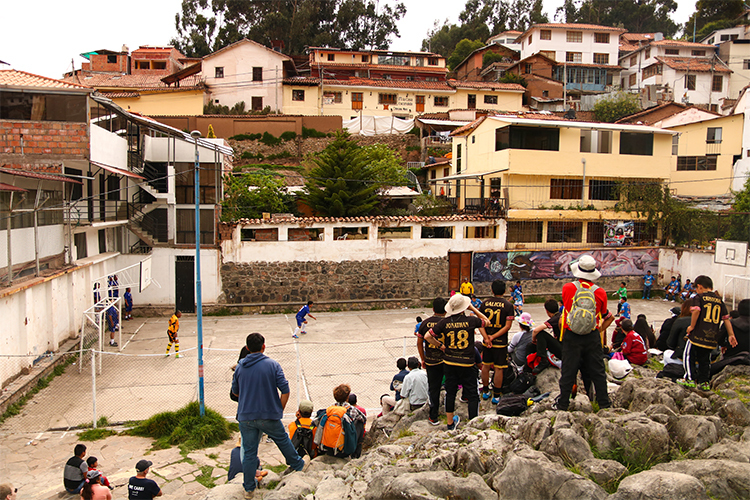 In Peru, the national sport is definitely football. You can play in the largest and smallest cities and it’s the opportunity to gather the youngest and oldest Peruvian, from the poorest to the richest around the “Pelota”. The Sunday afternoon across all the country, you can find Peruvian people next to the stadium supporting the local club. In a small street of Cusco, while going down from the archeological site of Sacsayhuaman, we have been surprised to hear the passion of the fans, without even have the stadium in our eyesight. Intrigued, we have followed a man wearing a football top in one of the small streets and we discovered the small stadium in the area. On a Sunday, between three walls of massive buildings, there is an amateur tournament between different teams of the local area playing on the asphalt ground. At the opposite of the substitute bench, there are the supporters sat down on a rock with a beer and encouraging their friends. We sneaked in, just the time to watch a match and to enjoy this specific atmosphere offered by the amateur sports, no matter the discipline or the country. Regularly in the service stations, we exchange a few words with the staff being curious about our vehicles. In the Urubamba city, our passage by the Repsol service station was not an exception to this “rule”. After presenting our travel and the sidecars specifications, the petrol pump attendant showed us the photos of his 150cm3 motorbike. We started to discuss about his passions and the 2-wheel universe in Peru. We never enjoyed to take as much time as this day to get petrol. Just before to go back on the road to Cusco, he gave us two rolls of toilet paper and two packs of biscuits to celebrate our meeting. A goodwill gesture that we will never forget as it was spontaneous and unexpected. To go to the Aguas Calientes village, at the bottom of the Machu Picchu, there is no possibilities with your own vehicle. We chose to take a “colectivo” (an independent bus from the travel agencies). To find our vehicle, we went on te main square in Ollantaytambo at 7am. When we arrived, a grandma spoke to us. We explained that we hope to find a colectivo to go to the Hidroelectrica Station which is a few kilometres before Aguas Calientes. She turned her back on us, just a few minutes to make a call and came back to say a colectivo could take us at 10am. We waited patiently on the square while having a breakfast. An hour later, another van driver told us he was able to take us in the next few minutes for cheaper. So we told to the grandma that we will go with him if she cannot offer the same price. Upset, she shouted at us and the driver that we finally followed. We went to his van parked in the next street. In front of the door, there were Hernandez (an English teacher in a high school in Puno) with 8 students who were waiting for us. Once our bags held on the roof, we took a seat in the mini-bus. But there was a problem. We were 14 people for only 13 seats. So we needed to squeeze on a bench seat. The van started and the adventure of a four-hour journey on a small steep road in the mountains began. The landscape was beautiful, the students danced and sang on the Peruvian pop hits. The atmosphere is friendly! Once the col reached, we did a break in a small village. The students took this opportunity to buy a huge quantity of bananas for sharing with us. In the meantime, Hernandez cut a cactus and put it on the van roof. He wanted to bring it back to his school as the students do not have the opportunity to see this kind of cactus there. The trip ended on a mountainside, on winding and dangerous roads where two vehicles couldn’t cross each other. We crossed fingers and closed our eyes during these thirty kilometres separating us from our arrival point. When we were out of the van, we did a few photos with all the class and the cactus, before our paths diverged.